Our clients asked us regularly what our favorite family-friendly all-inclusive resorts are. 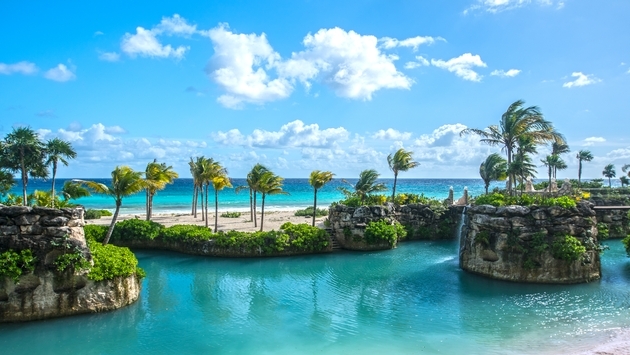 We offer our recommendations based on our own personal travel experience as well as experiences our clients have had staying at the various resorts around the Caribbean and Mexico. But with how often we are asked, we figured it may be a good time to put it all into a blog so our feedback can help others out, too. 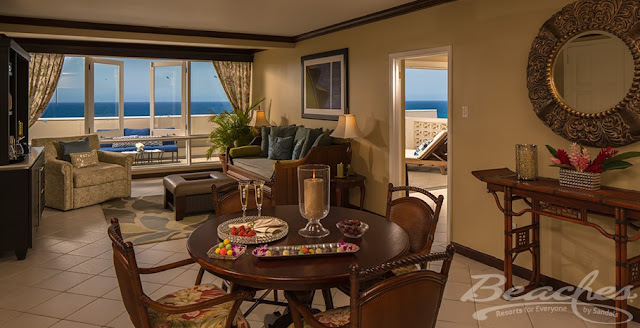 The list below is our picks for the Top 10 Family Suites we love to book for our clients. Of course, they are in ABC order because it's hard to rate them against each other. Recommended for: Families with kids of all ages. 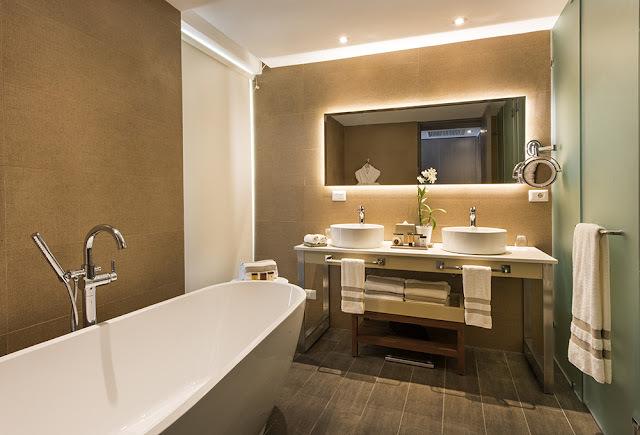 For those who want the best of the best, this is the top suite available. 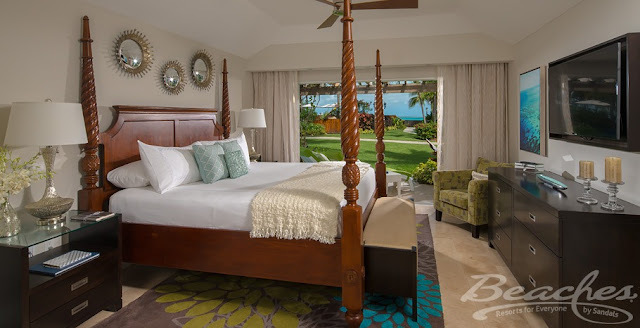 Located on the 4th floor with ocean and pool views, you'll have a master bedroom with a king bed, a second bedroom with two double beds, and a private living room and dining room area, giving your family the maximum amount of space. The suite can hold up to 6 people total. Presidential services include pre-arrival butler services, private check-in, champagne and fruit basket upon arrival, pillow and aromatherapy menu, WiFi, personal butler services throughout stay, full bar in-room, DVD menu, reserved beach or pool cabana bed, pool and beach butler service, dinner reservations and a private in-suite check for dinners. Want something a little less extravagant? 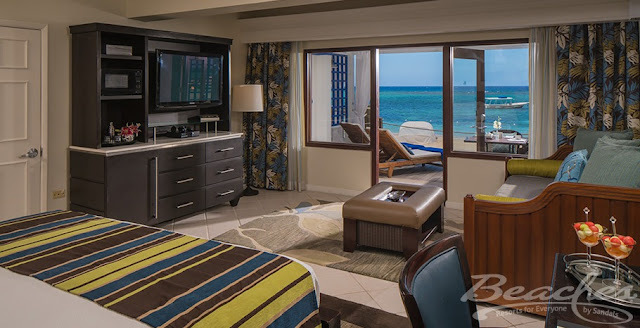 Enjoy the luxury of a swim-up suite without the price tag that you see with most of the big name resorts. This room can hold up to 2 adults and 2 children (or 3 adults and 1 child) with the option for one king bed or two double beds. 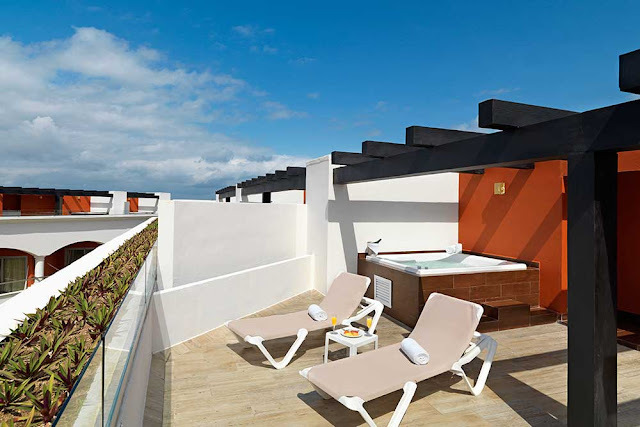 But the best part is the personal outdoor Relaxing Hot Tub and underwater chaise lounge in the swim-up pool just steps off the terrace. You can watch the kids play in the pool while relaxing in the warmth of your own hot tub. 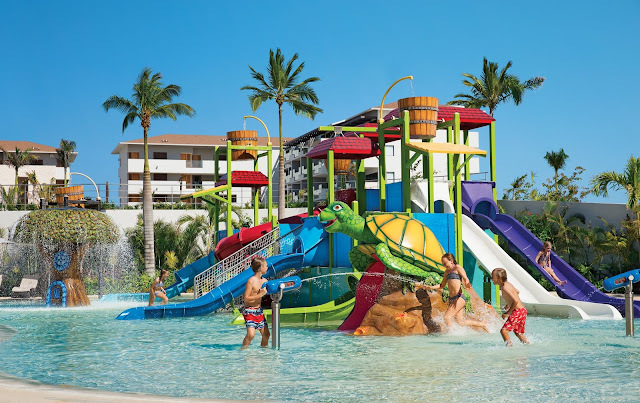 Why do we recommend this resort for families with kids of all ages? The kids club, titled Azulitos, is available for your children ages 4-12. 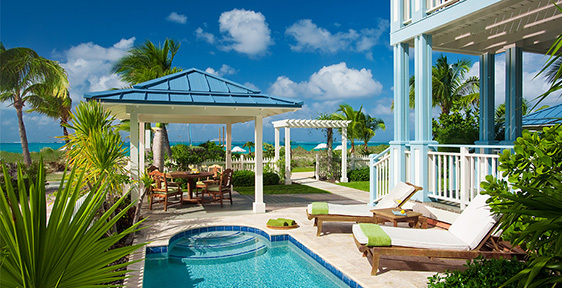 You can leave them in the care of trained professionals while you enjoy the spa, beach, or pool. Or bring your little one to the spa with you and they can enjoy a service from the kids spa menu. For the more active kids, head over to the My Gym fitness center where kids from ages 4 to 12 years old can enjoy daily classes and programs. Your junior gymnast can have a ball and build self-esteem on ropes, parallel bars, trampolines, springboards and big floor pads. Teens don't have to worry about being bored. The Extreme Breeze Teen lounge has movies and music videos, Xbox, Playstation 3, Wii, billiards, air hockey, daily, organized indoor activities and outdoor activities which include a rock climbing wall and volleyball court. 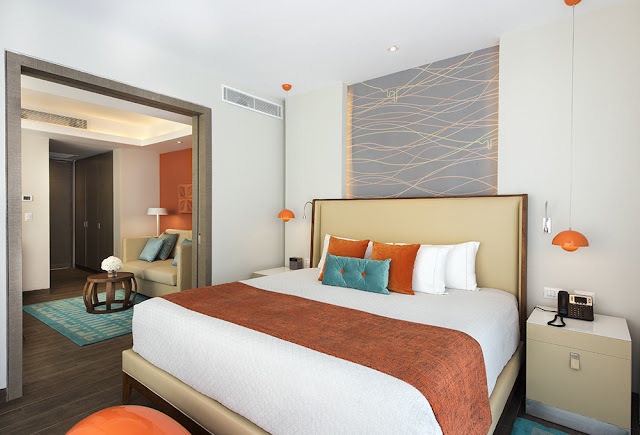 We're highlighting the two bedroom option, but this suite is also available as a one bedroom (minus the room with two double beds) or a three bedroom (plus an additional room with two double beds). So there are definitely options for smaller and larger sized families. 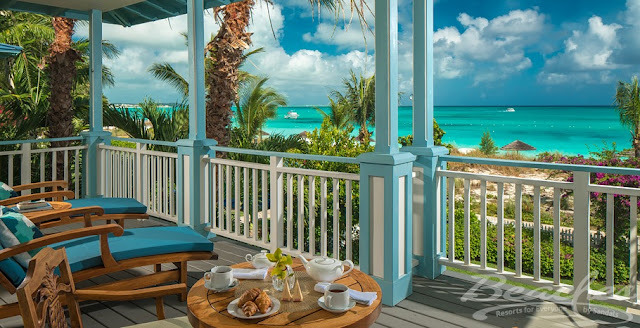 All options come with the Beaches signature Butler level service where you get your own personal butler to attend to your needs during your stay. 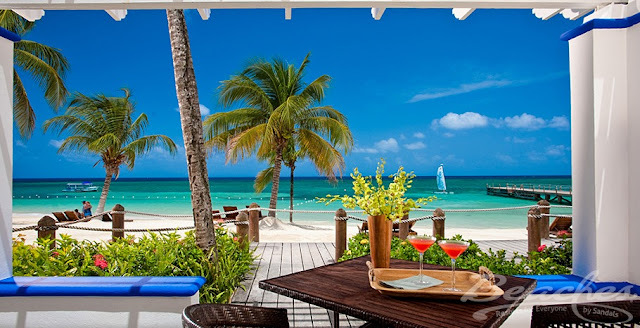 The best part is you get a beautiful view of one of the best beaches in Jamaica, right from your room. 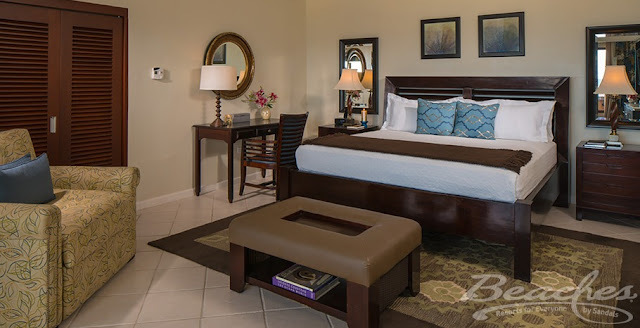 This particular suite sleeps 8 total, which includes a master bedroom with a king bed, a second bedroom with two double beds, both connected by a living room with a twin trundle bed (sleeps two). There is no shortage of things to do. 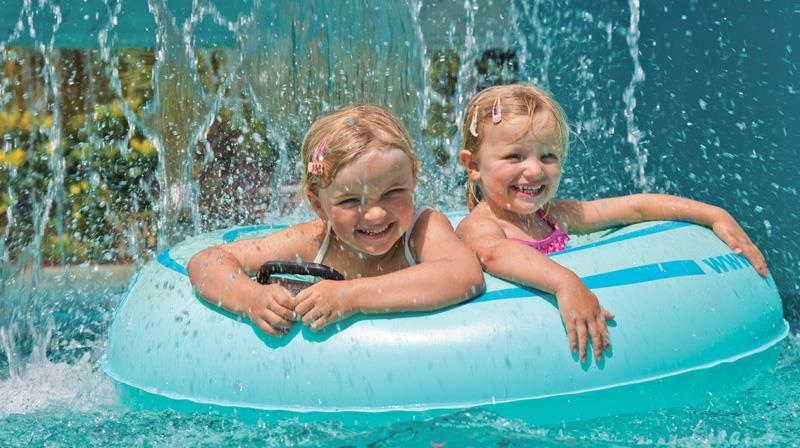 Hang out in the water park and enjoy the lazy river, or slide down the water slides and make a splash. Take a kayak out on the calm crystal-clear water and watch the fish swim below you (included for guests). Want something a bit more high speed? 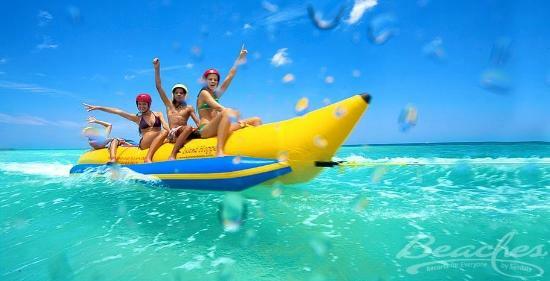 Try the Banana Boat ride or tubing (included for guests). Or take the adventure off property and try the snorkeling excursions. Beaches will take you by boat to snorkel at some of the best spots in the area. 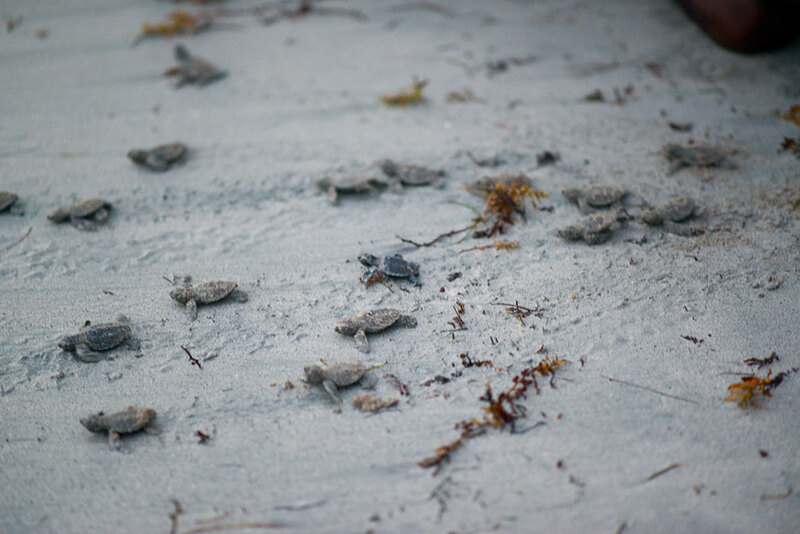 No matter which Beaches resort you stay at, this is an included perk for all guests. If you prefer to just sit back and relax, know you're doing it on one of the best beaches in the world. 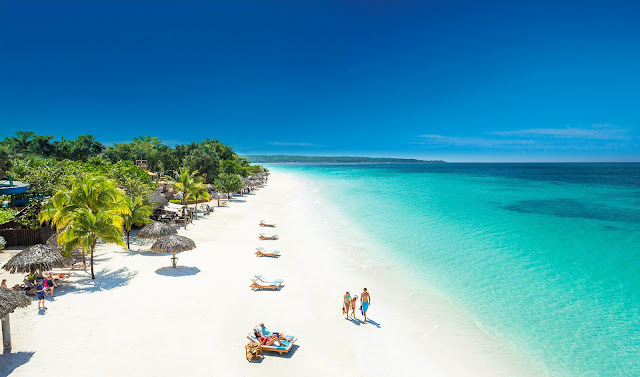 Negril's famous Seven Mile Beach boasts calm, crystal clear, bright blue waters, with waves so small that they lap at the shore in a whispered hush. 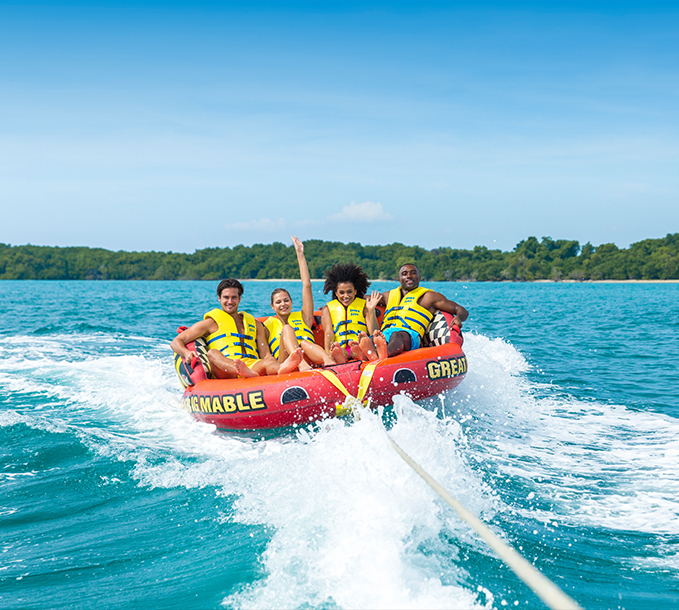 The ultimate way to relax at Beaches Negril? 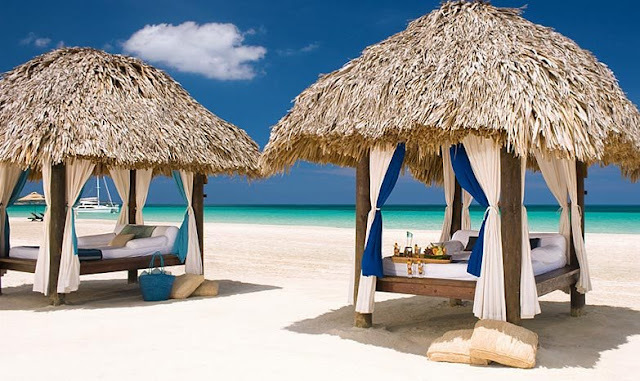 Rent a beach cabana and lay in a comfy shaded bed. Perfect for parents who want to rest while their kids play in the sand and sea all day. 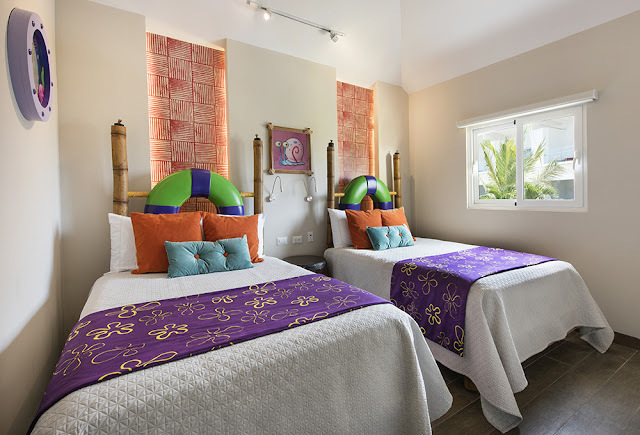 Or for families with little ones who need a nap break mid-afternoon, but you don't want to leave the beach and sit in the room while they sleep. 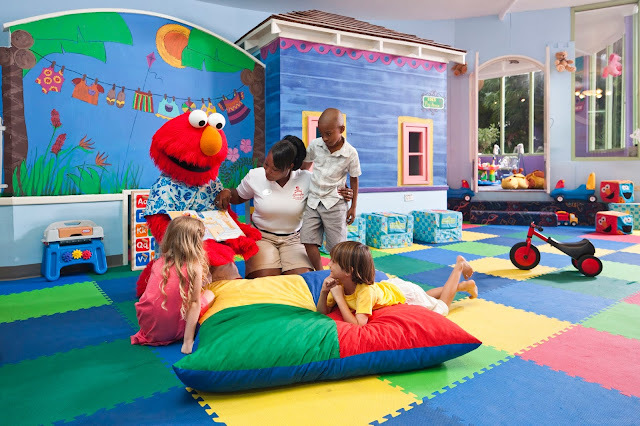 The younger kids will love the Sesame Camp for kids, where they can bake cookies with Cookie Monster, read stories with Elmo, and hang out with some of their favorite Sesame Street characters. But don't worry, if you don't go to the kids camp you can still see the characters around resort. You can also set up a breakfast with them or "tuck in time" where they come to your room and read you a bed time story before tucking you in (both for an additional cost). 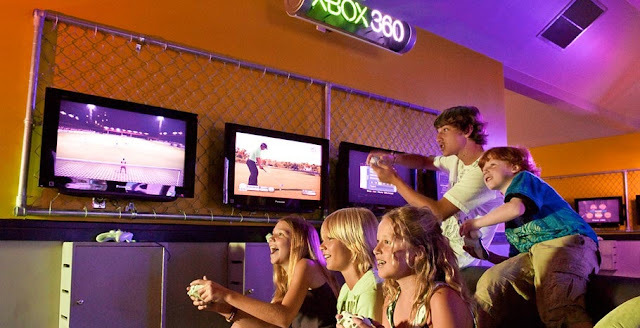 Teens looking for fun things to do will find the Xbox game garage, arcade, and the popular teen night club "Liquid" which is open to teens until around 11pm when it shuts down and is turned into an adults only night club. 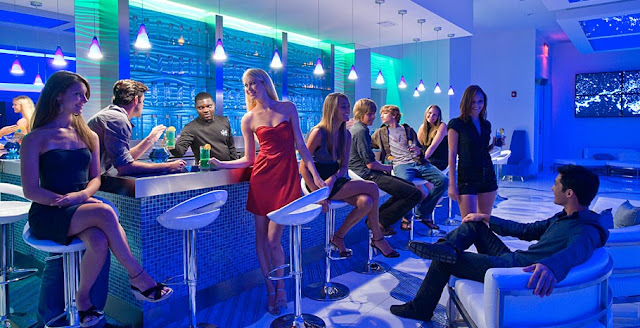 During the time the teen time, there is no liquor in the club, but mock-tails (alcohol-free cocktails) are served. Recommended for: Families with younger kids under 13. 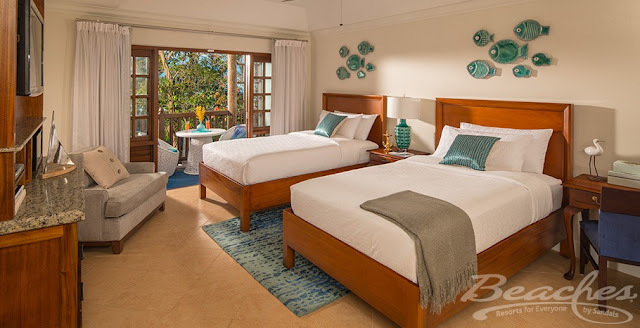 Situated on the top floor of the resort building, this room category offers a king bedroom with a separate living room that has a trundle bed (sleeps 2) and space for a rollaway, and a bathroom with a stand-up shower and double sinks. The room can sleep up to 5 people. 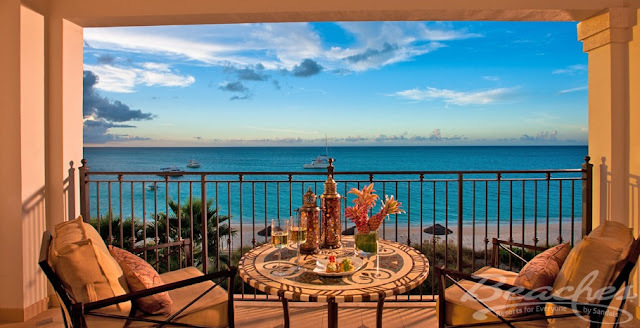 You also get the most stunning ocean views from your expansive balcony. 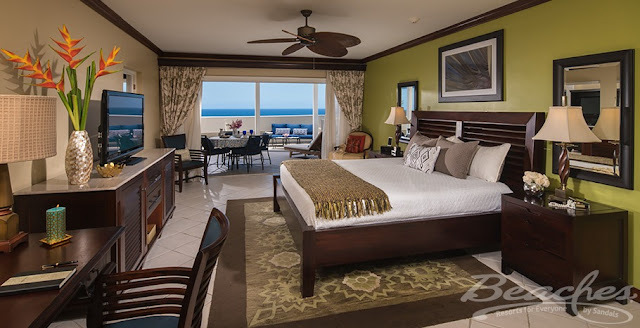 Or, if you'd like an option that puts you much closer to the beach, you can try this beachfront walkout suite which allows you to be steps from the sand. 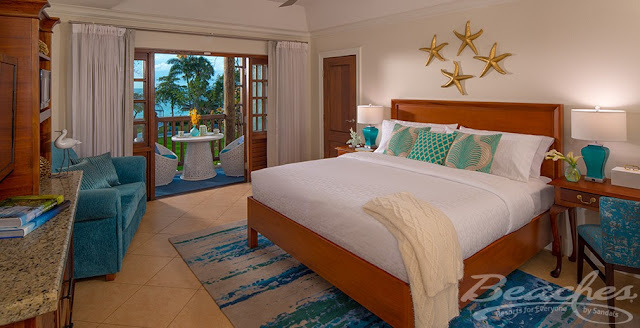 With a king bed and a trundle bed, this room category only sleeps 4, so it's not a great option for slightly larger families, but if you're a family of 4 who loves the beach and being as close to the water as possible, this is the perfect room option for you. 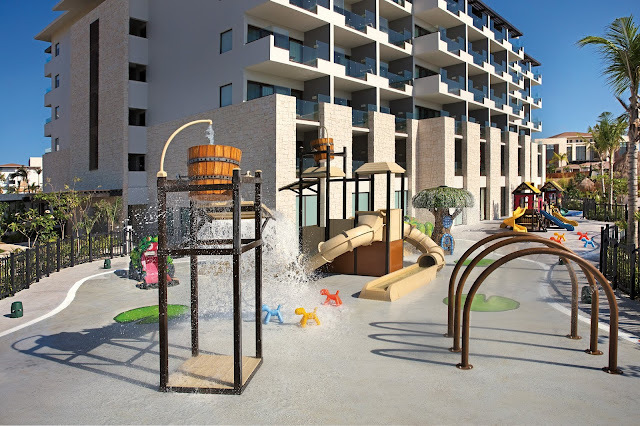 Families staying here will love the water park. 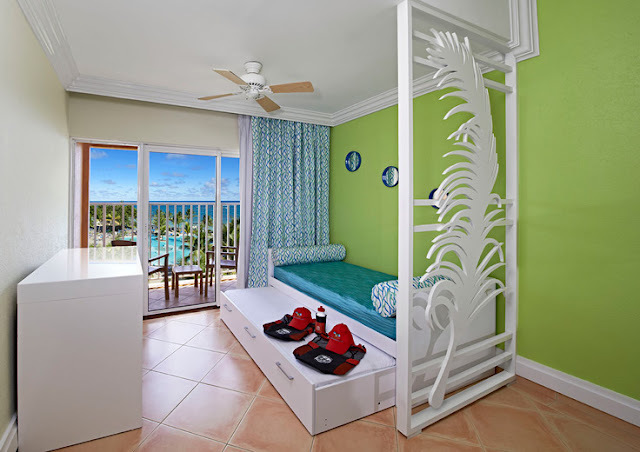 We recommend the property for families with tweens or younger, mainly because there isn't as much to do for teens here as there is at the bigger Beaches Negril or Beaches Turks and Caicos properties. 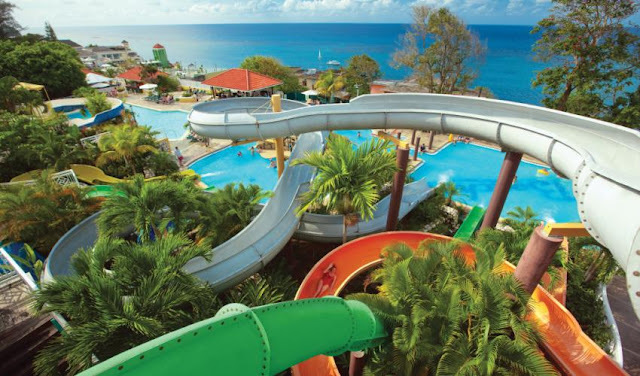 The water park has a few large slides that overlook the ocean, plus a few smaller slides for the younger kids. There is also a shaded wading pool for toddlers and babies off to the side of the water park area. Kids have their choice of fun activities through the day and night including access to the Xbox game garage, a small arcade, billiards/pool, and more. For the very little ones, there is the Camp Sesame, unique to the Beaches brand. 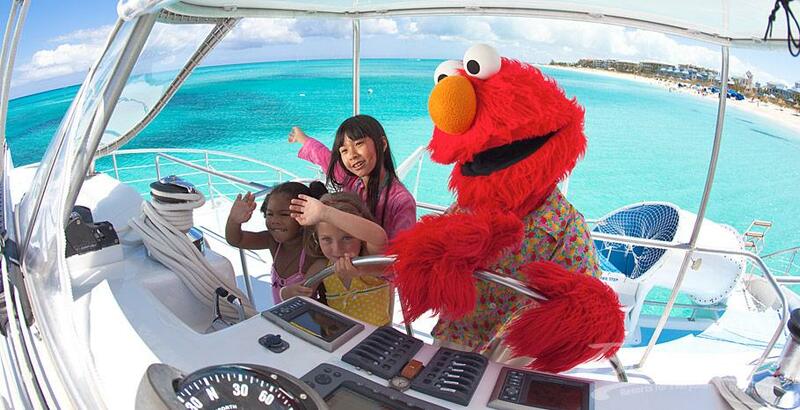 Kids can read stories with Elmo, bake cookies with Cookie Monster, and much more. 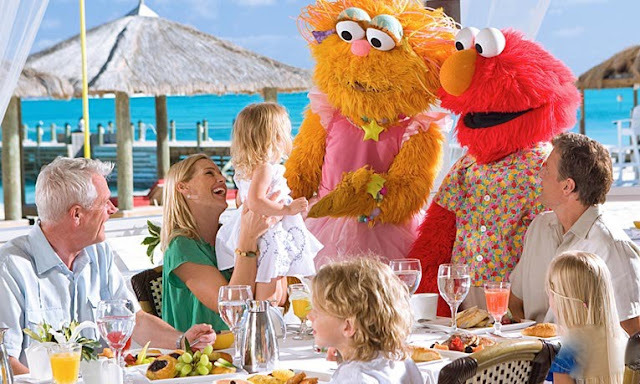 But don't worry, you favorite Sesame Street characters are also hanging out by the pool during the day, putting on live shows in the evening, and you can even have breakfast with them or have them come tuck you in at night and read you a story (for an extra cost). Recommended for: Families with kids of all ages, especially older kids. 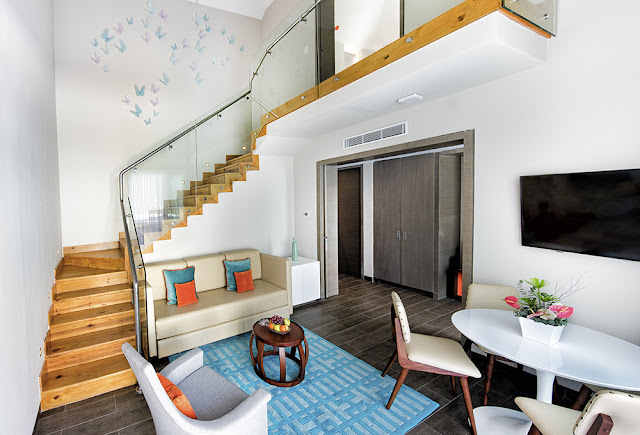 Grab the whole family, this suite can fit them all. 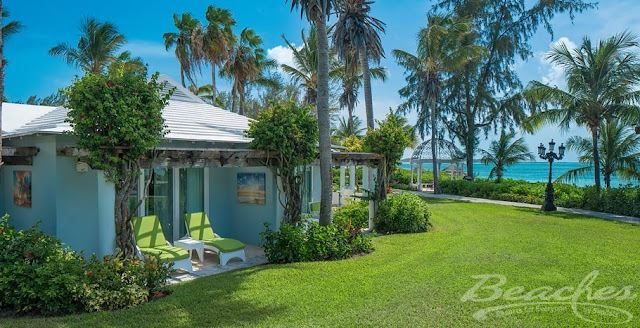 The villa has four separate bedrooms and bathrooms, a spacious living room, full kitchen, dining room, a loft area on the top floor, and a private pool in the yard just steps from the beach. The fact that it can accommodate up to 10 people means this Four Bedroom villa is the perfect place to host your next family get-together. 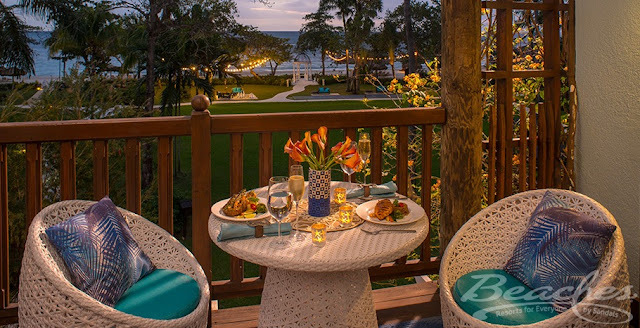 Best part is, it comes with the signature Beaches Resorts personal butler service and private transfers, which means your whole family is being pampered from the moment you arrive until the moment you leave. 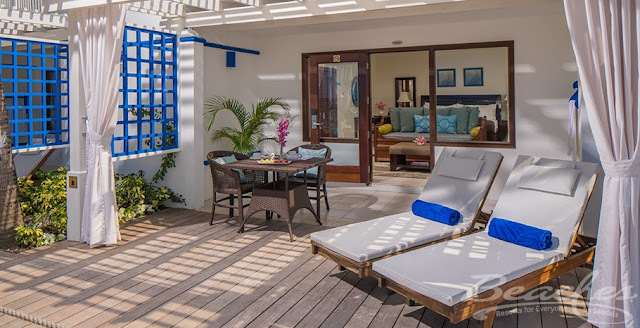 Just steps from the beach, this villa has a bedroom with two double beds and a bathroom, a separate living room area complete with a pull out sofa, a dining room table and kitchenette, a second full bathroom and then a master suite with a spacious soaking tub in the ensuite. 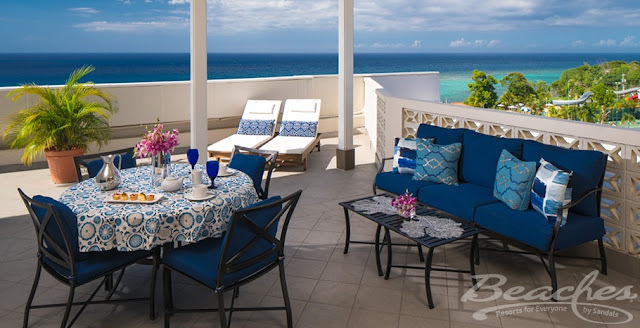 Plus, it comes with the Beaches signature butler service as well as private transfers. Looking for something a little less opulent for your stay, but still want the space and privacy from your kids? Check out the Italian Village. 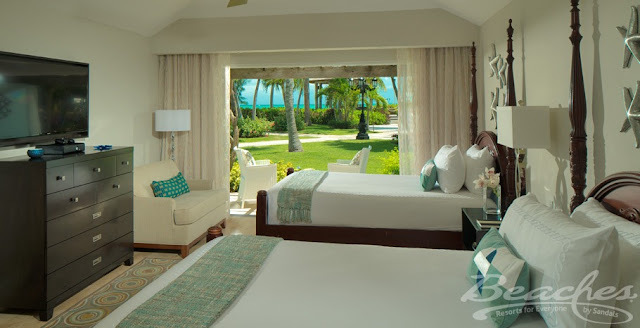 This particular suite comes with a king bedroom that has an ocean view you'll love. 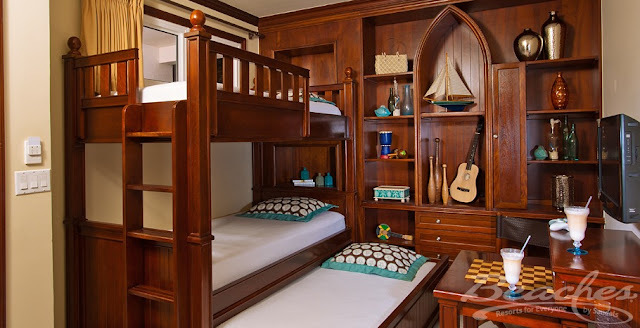 There is also a separate kids room which has bunkbeds and a trundle, meaning it can sleep up to 3 children in the kids room. Plus, the king bedroom has a trundle bed and a pull out chair for 3 additional children. It would be tight to fit 6 kids, but it will work if you have a range of ages that include smaller children. There is a sliding door for privacy between the kids room and the king bedroom area. 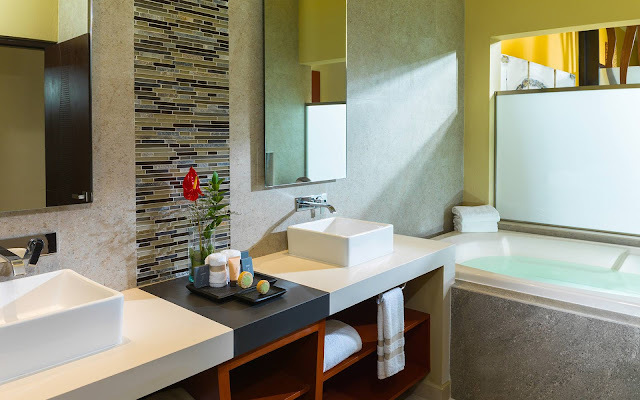 The shared bathroom is a beautiful space with a separate water closet (for the toilet) and a soaking jacuzzi tub as well as a stand-up shower. 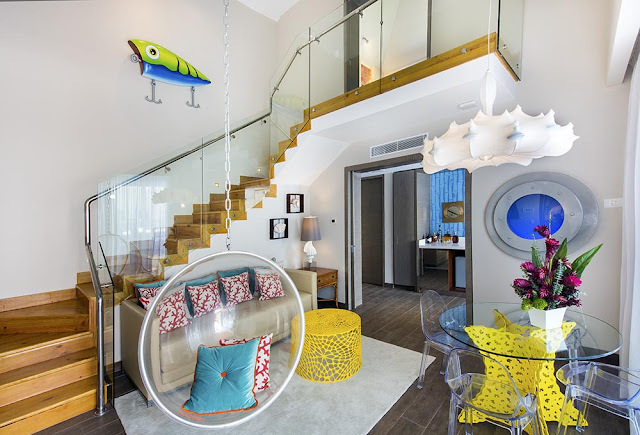 Why do we recommend this property for families with kids of all ages? Because it's truly got something for everyone. 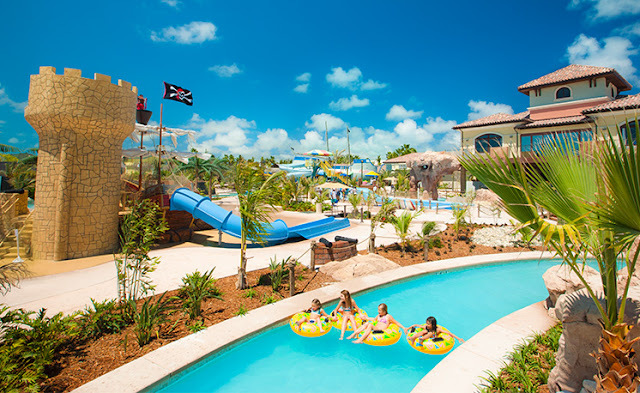 First, it's the large "Pirates Island" water park which has slides, a lazy river, and even a surf simulator. 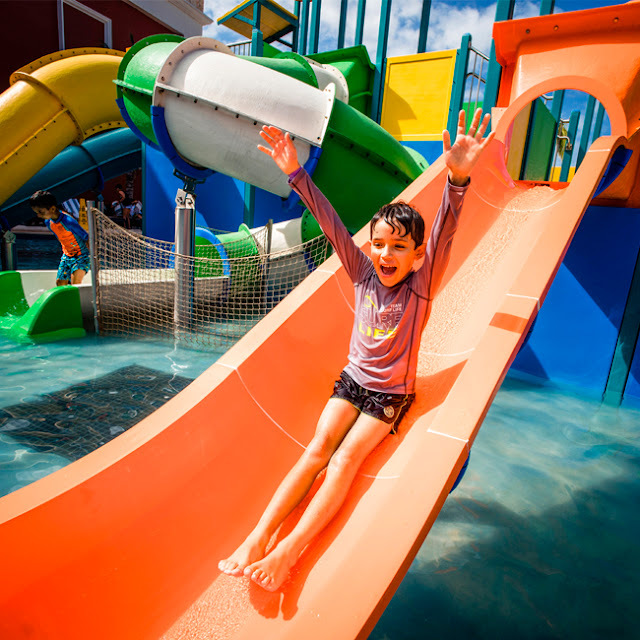 One of our favorite areas for kids at the waterpark is Bobby Dee's. Inside of what looks like a boat is a fun 50's styled dinner with the most delicious chicken nuggets, milkshakes, and more. But outside in the pool is a swim-up-bar for all ages that serves "mocktails" (non-alcoholic cocktails) to kids of all ages. 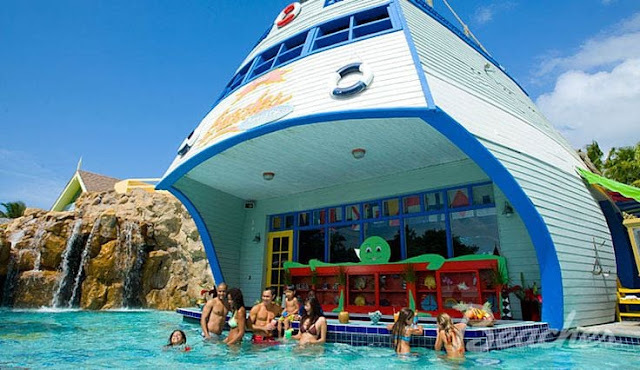 Of course kids can swim up to any pool bar and get a mocktail, but slide down the slide and then swim over and grab a cool drink is a vacation experience in and of itself. There is also an Xbox game garage where kids of all ages can hang out in a safe and air-conditioned space, supervised, and play some of their favorite video games, including new releases. 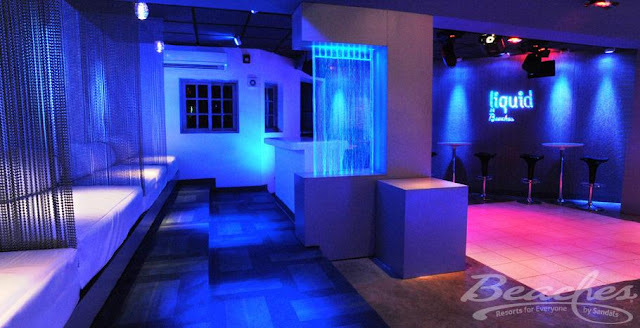 Teens can enjoy Club Liquid, which caters to their age range up until late at night when it switches to an adults only (18 and older) night club. While it's a "teen club" there is no liquor served, however "mock tails" (non-alcoholic cocktails) are served for teens. 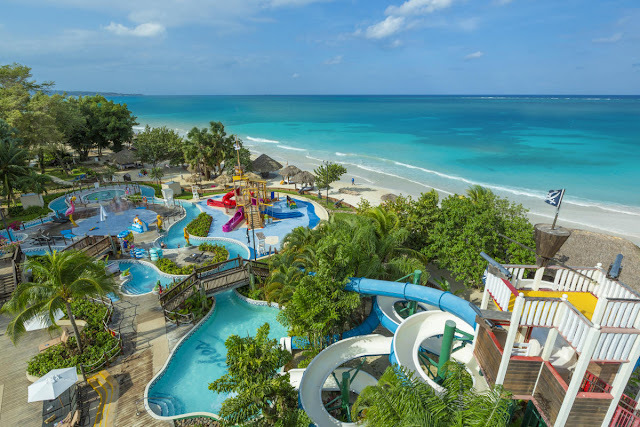 Trenchtown is an arcade on property, right next to the water park, that is available for kids to enjoy. Giving tweens and teens a fun, comfortable, and supervised place to hang out during the day and into the night. 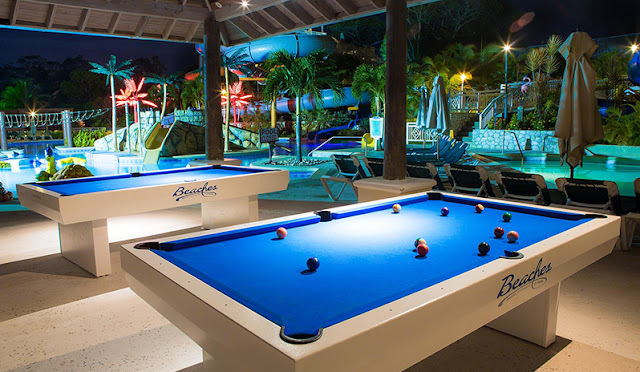 There is air hockey, arcade games, billiards/pool, and more. 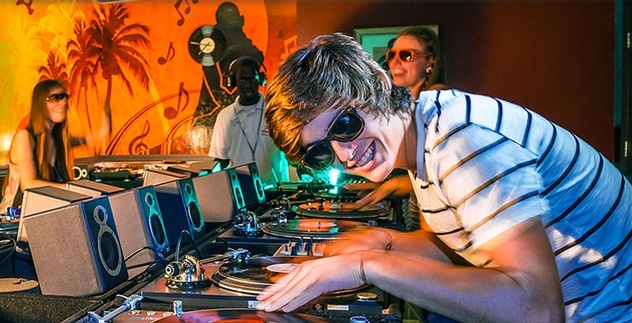 Kids can also do the Scratch DJ Academy and mix their own beats. For the little ones, there are supervised kids camps, which don't just mean you drop your child off to sit in a small playroom all day. 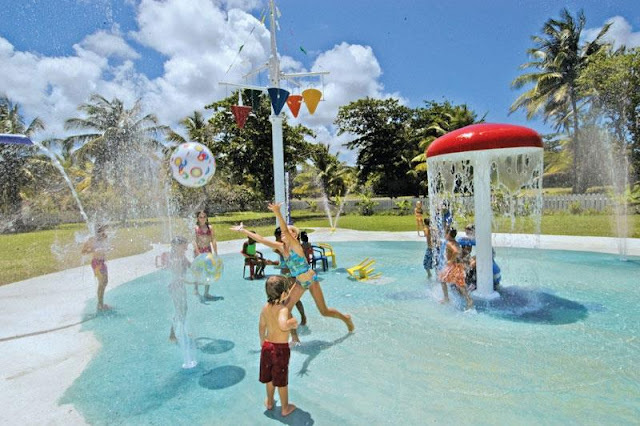 The fully certified staff watching your children will do fun activities with them including take them around the resort to do the fun pre-planned activities for their age ranges that are outside of the camp room. 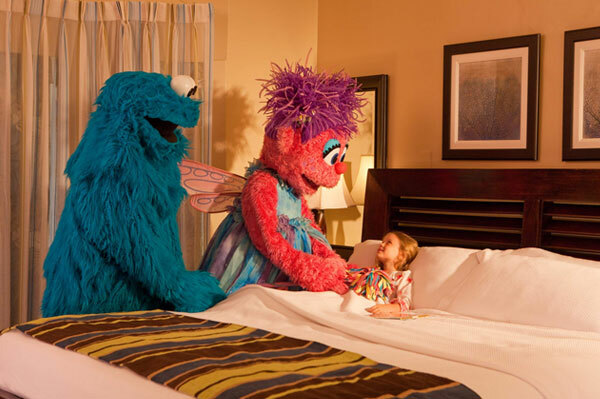 Smaller kids love the fact that they can meet with their favorite Sesame Street characters who walk around the property day and night greeting guests. They even have a parade in the evenings which kids and their parents line up to see like it's Main Street in a popular family theme park. 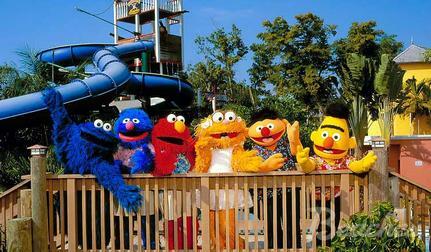 Each night the Sesame Street crew put on a fun show that your little ones won't want to miss. And the fun doesn't end when the sun goes down. 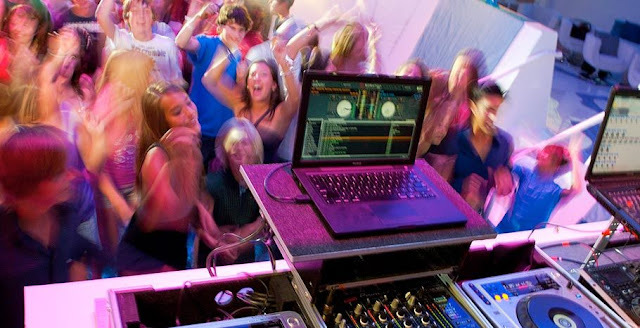 There are plenty of things for kids of all ages to do well into the evening. Of course, there are also plenty of water sports options during the day time as well. 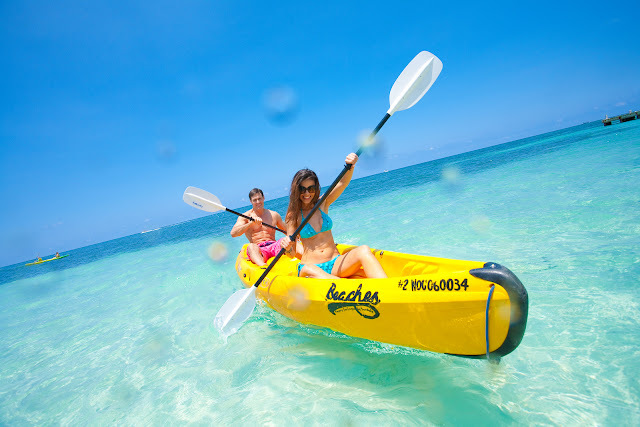 Like all of the Beaches Resorts brands, you will find everything from snorkeling to sailing and all the fun things in between. 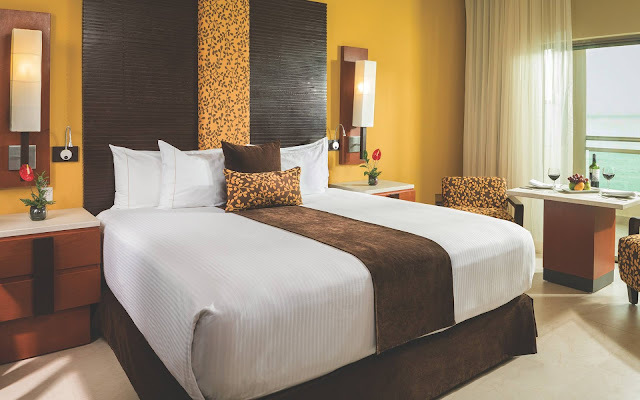 You'll have a king bed with a trundle bed (two twins) or two queen beds with a sofa. The resort caterers to all ages. Why? 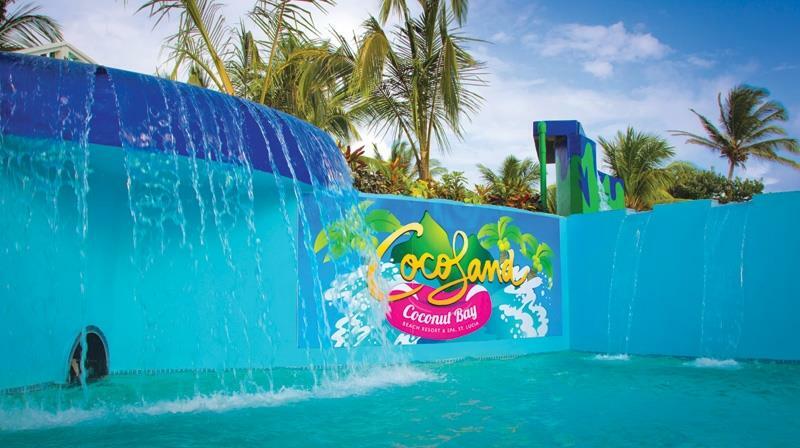 For starters, it has CocoLand which is made specifically with kids of all ages in mind. It has a pretty awesome water park. It includes a massive lazy river that winds around the property. 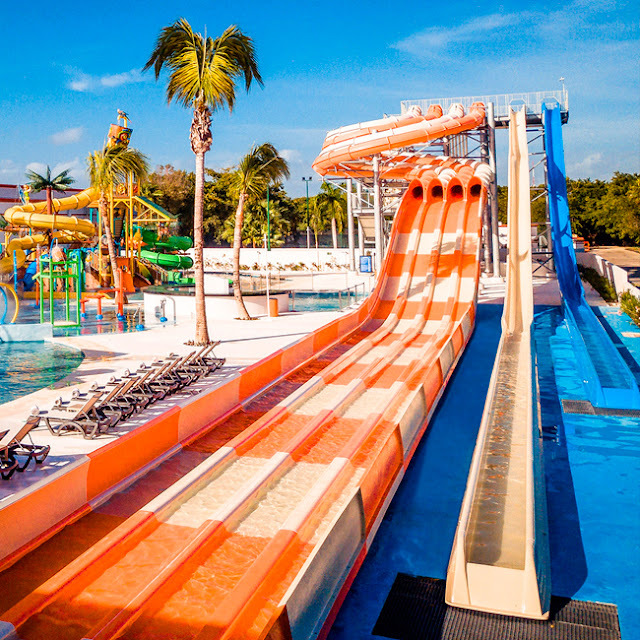 Fun twists and turns on huge water slides. And even a splash zone for the little ones. 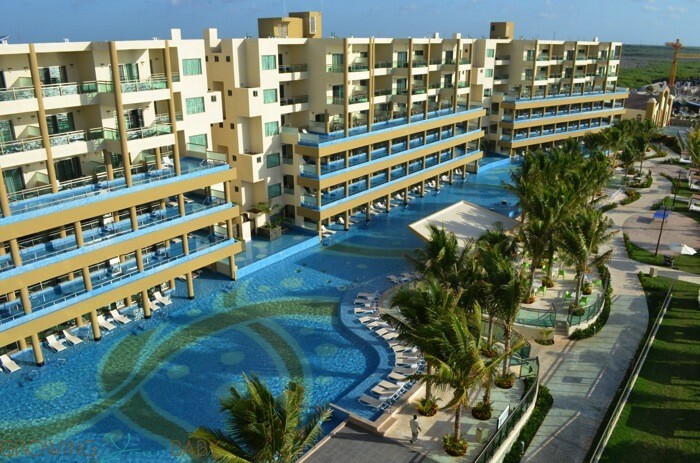 Plus, a big zero entry pool that overlooks the ocean. But also, paintball is available for resort guests! That's a cool feature you won't find anywhere else currently. (It's currently at an additional cost of $20 per person, per game which includes your gear and ammo). 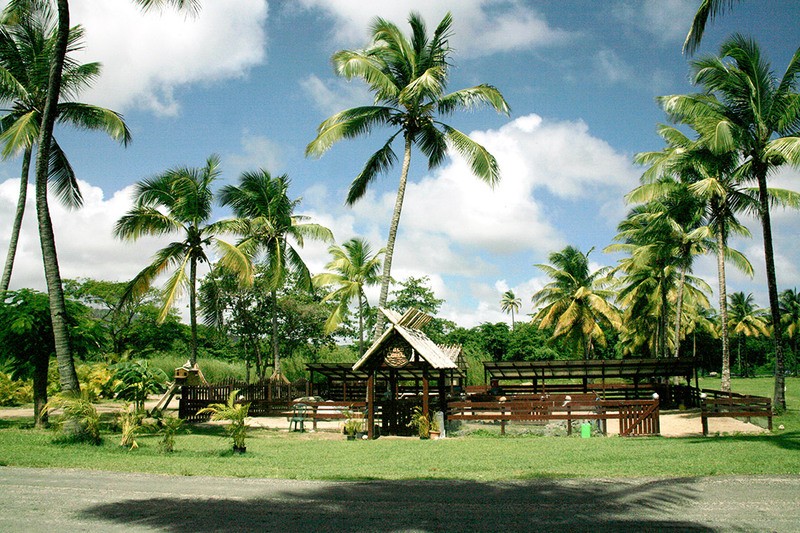 Kitesurfing is also available, at an additional cost, on resort. Little ones will love the Cocoland Kidz Klubs which are broken up into three clubs. The first is for 3 and under, the second is for ages 4-7 and the third is ages 8-12 years of age. Babysitting is also available for an additional fee. The Kidz Klub is the place to be. 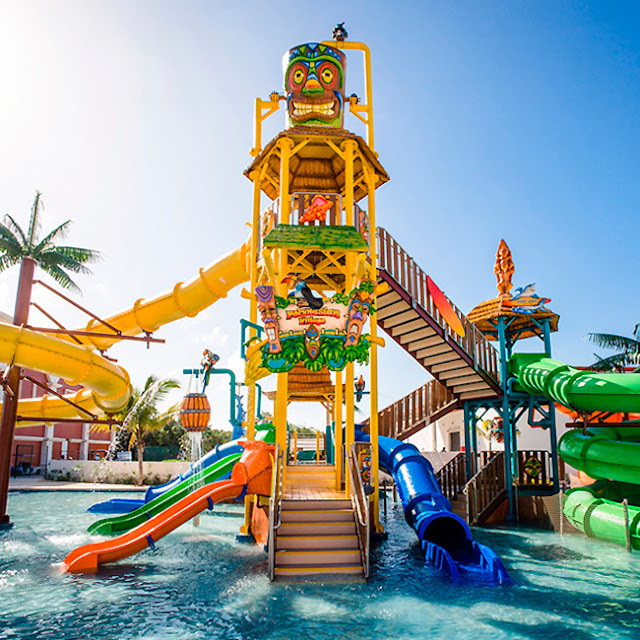 Its designed to be a playful universe complete with a pirate ship, a mini rock wall to climb and a mini zip line to ride. 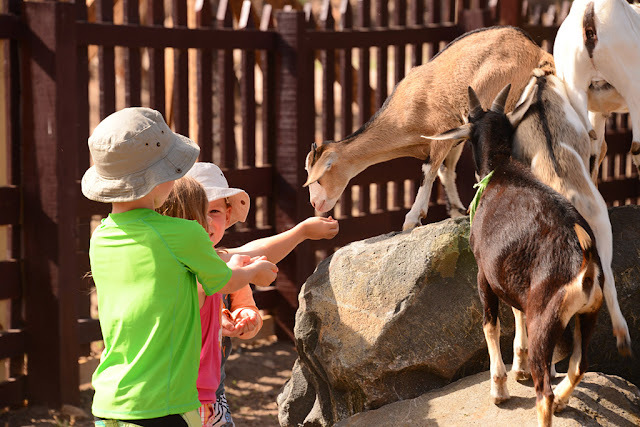 Kids will also have access to Coco Corral the Cocoland petting zoo which has a small variety of rescued animals such as goats, ducks, sheep, donkeys and horses. Kids can meet, feed and pet the animals during their time at the Kidz Klub which is another unique first for an all-inclusive family resort. Coco Corral, also has a turtles release program right from the beach in nesting season which you and your kids can be a part of. Plus the fun costumed characters who hang out around property. 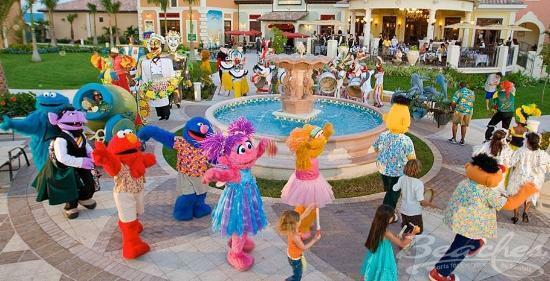 Instead of being contracted with well-known cartoon characters, Coconut Bay has something unique. Their own characters, Coco and Loco. Join them for the Pirate Parade, or check out the Movie Night, Disco Night or Talent Show for the Kidz Klub crew. All-in-all this resort is a really awesome experience for the price. 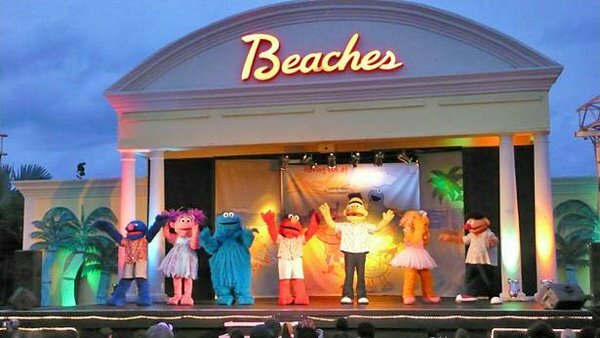 If you're looking for a fun family getaway for all ages without breaking the bank, this would be a great choice. 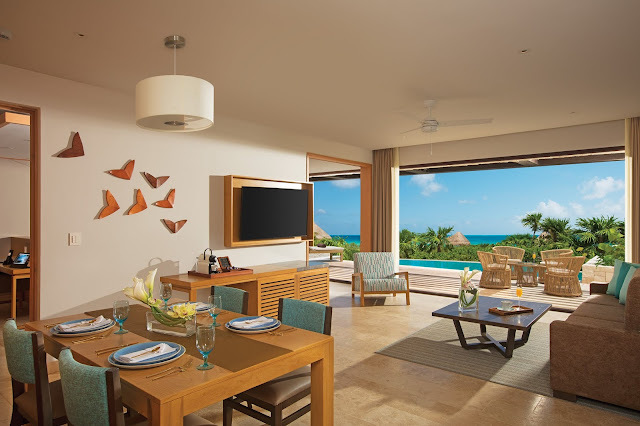 This oceanfront room with direct beach access and a private pool is our top recommended suite for this family-friendly resort in Mexico. 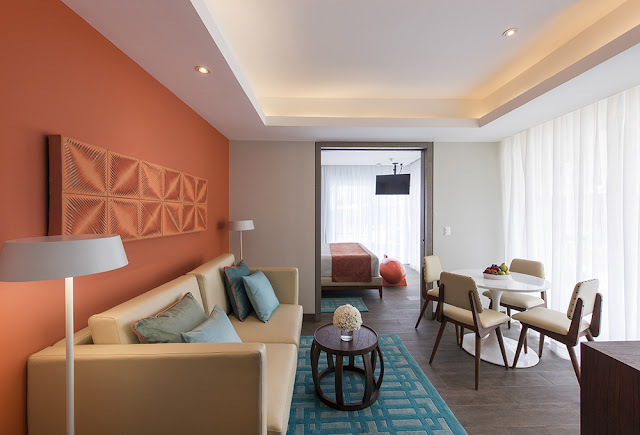 Located a little further North of downtown Cancun, it's the perfect place for families to get away for a fun and relaxing vacation and this suite is made to ensure you're getting the most of your time off. 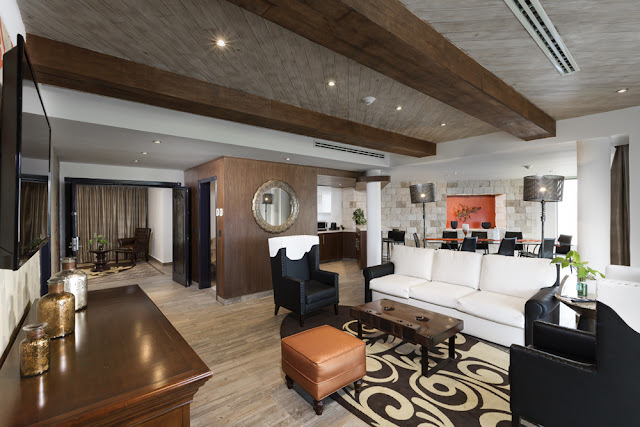 The suite comes with a master bedroom and bathroom, a living room area with a sofa bed for the kids, and Preferred Club access, which is the Dreams equivalent to concierge service. 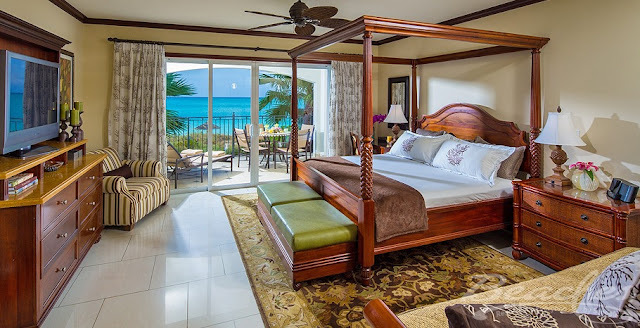 While this particular suite only accommodates a family of four, you do have the option to book a Preferred Club Junior Suite Ocean Front with Private Pool with two queen beds and have the rooms connect making this a two bedroom suite. 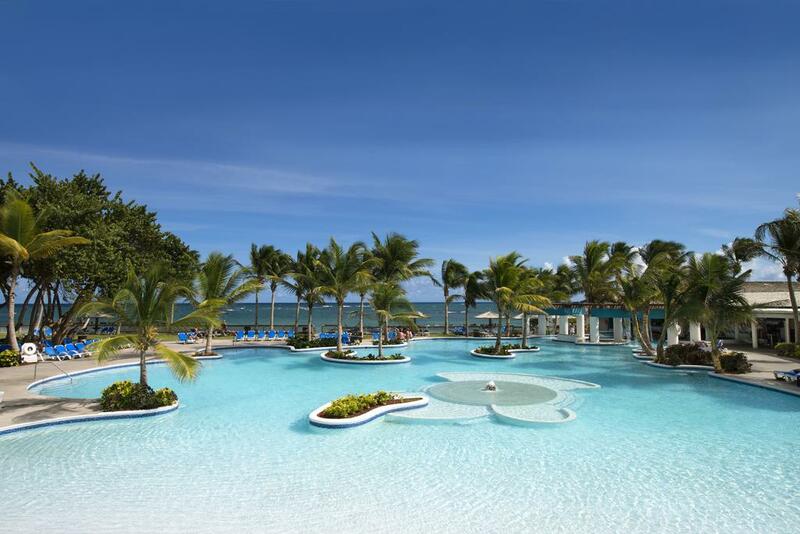 Why do we recommend this resort for families with kids of all ages? 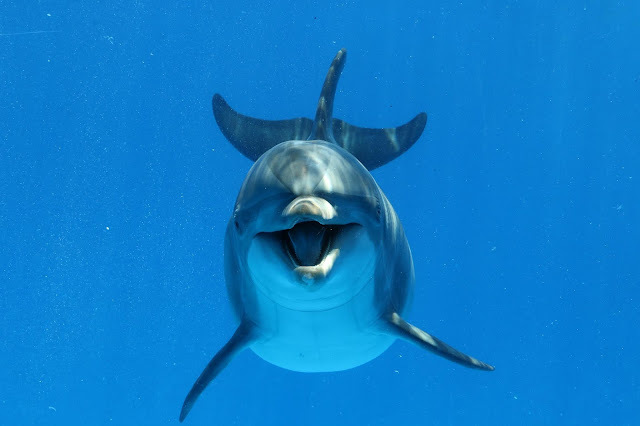 There are kids camps, a teen club, water park, and even a dolphin habitat on resort. The options are endless. Our favorite is the beautiful lazy river, which is for Preferred Club level guests only. 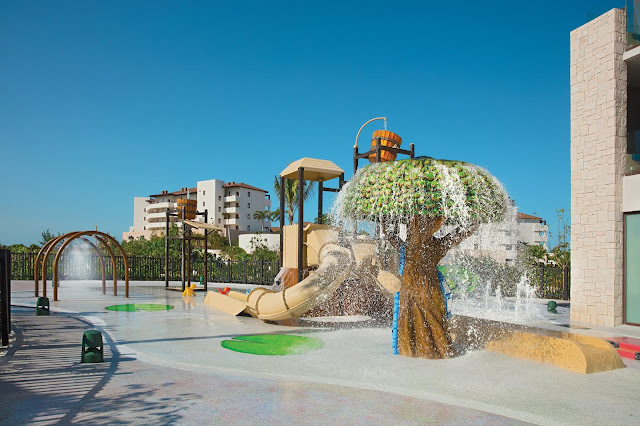 There is also a kids club with a water park specifically for younger/smaller children which includes a drop bucket, small slides, fountains/splash zones, and more. 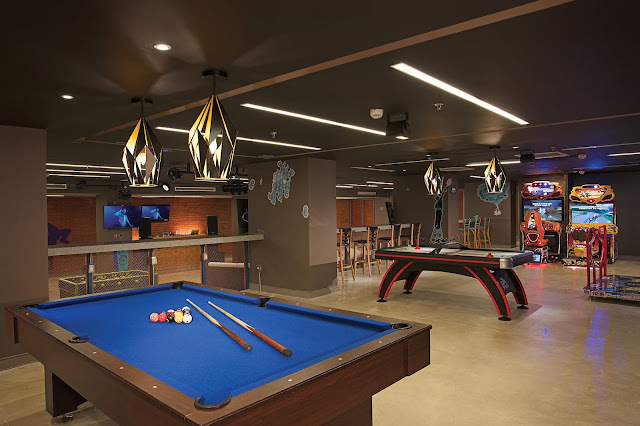 For teens there is the Core Zone Teen Club which has plenty of fun options for that age group, including billiards/pool, arcade games, air hockey, and more. Families can also enjoy the Dolphin Habitat and see or even swim with the dolphins without even leaving the resort. Recommended for: Families with older kids. 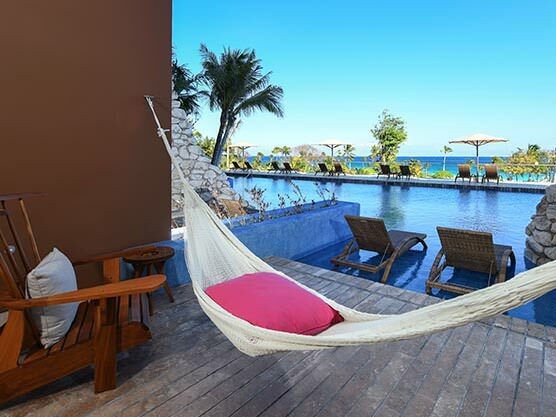 The swim up ocean suite offers beautiful ocean views from your patio, complete with in-pool loungers as well as a hammock for laying back and watching the day pass you by. If you do decide to travel with younger children, we recommend the Garden swim up suite so you can be close to the little kids water slides. You'll be able to keep an eye on them from the comfort of your hammock. This resort is one-of-a-kind right now in Mexico. 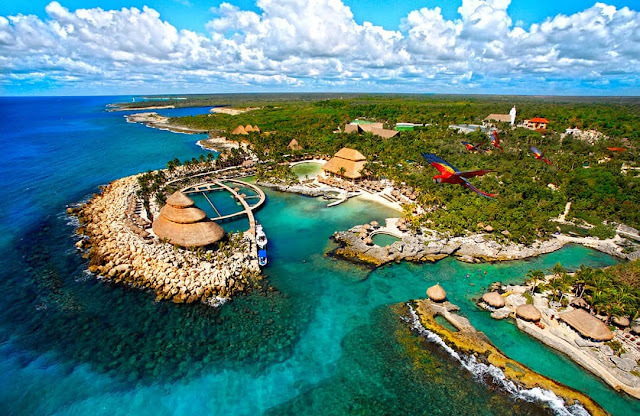 It's an eco resort that is all-inclusive and even gives you unlimited access to the parks Xcaret, Xel-Ha, Xplor, Xplor Fuego, Xavage, Xoximilco and Xenses, as well as tours to Xenotes and Xichen... yes, all included in your stay. 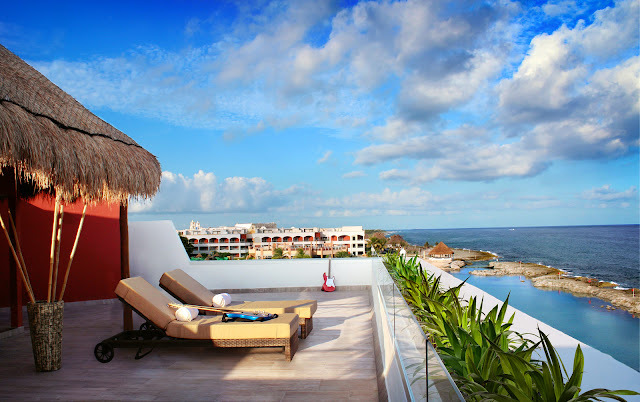 It's an incredible value and the resort is just as incredible too. Why do we recommend it for families traveling with older kids? 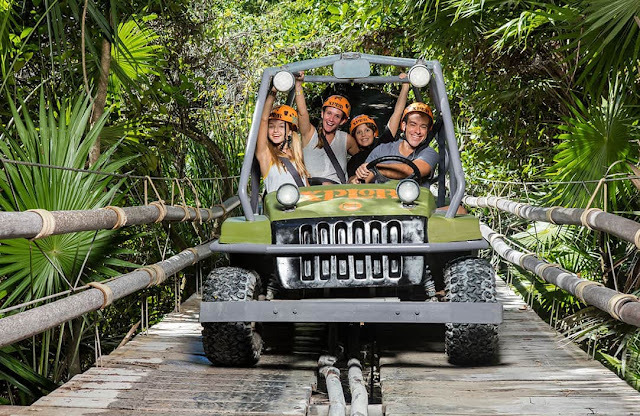 Families with very little kids won't be able to take advantage of the full package and enjoy the parks or excursions included. So it's best to travel here when your kids are of age where they can appreciate the inclusions and you get the most for your money here. 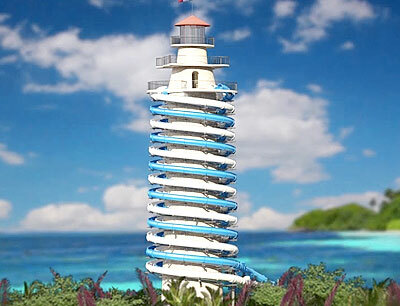 Don't forget to try out the massive water slide that goes down an old light house. Very cool! You'll be highly impressed at how this resort has managed to combine nature with luxury and have given adventure-lovers a new home away from home. 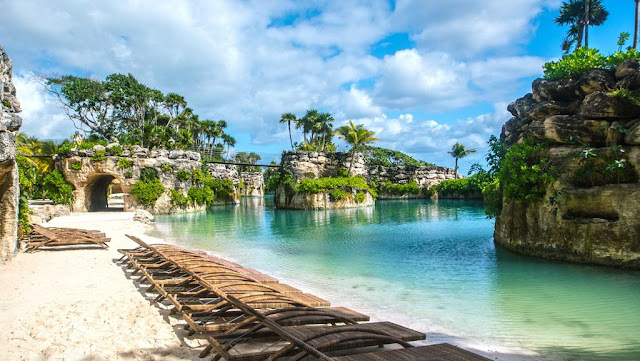 Swim among the lush, tropical, jungle like-atmosphere. 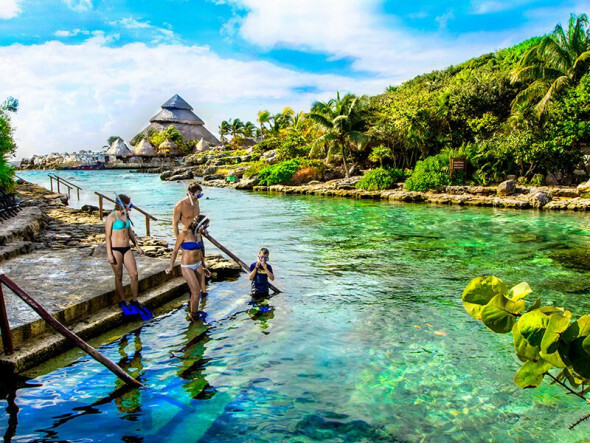 Snorkel and see all the marine life that frequents the lagoons. 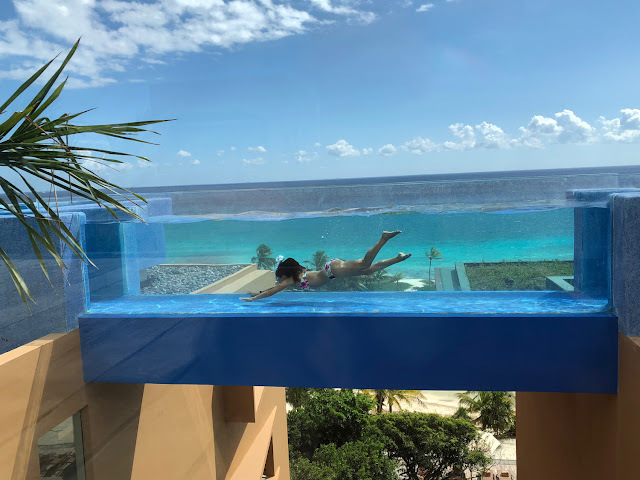 Or, enjoy infinity pools in the sky. Recommended for: Families with young kids. 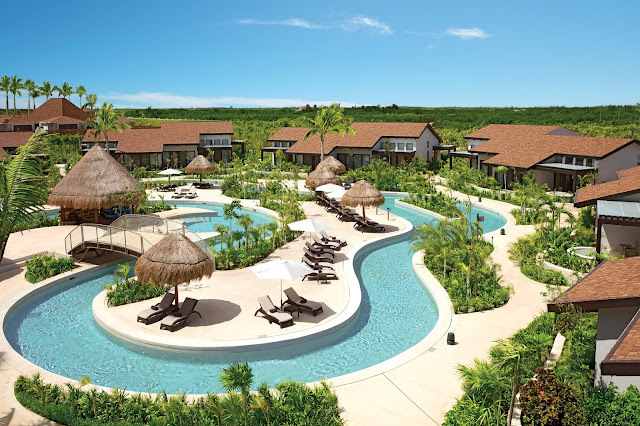 There are so many things to love about Generations Riviera Maya. But one of our favorites is the uniqueness of their rooms. This resort chain took their swim-up suites to the next level, literally. It's one of the few places in the world where you'll find full length pools spanning the entire building several floors up. Families now don't have to sacrifice views for swim-out room options. 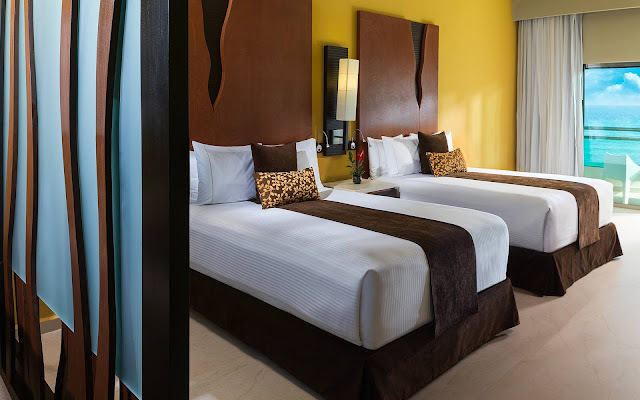 At Generations Riviera Maya you can enjoy both. And the rooms are tastefully decorated, very comfortable and spacious. Of course, the higher the amount of bedrooms the more space you'll have overall. 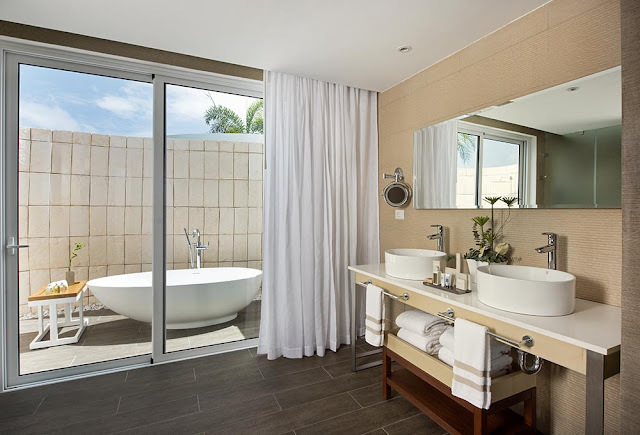 But our favorite feature is the private outdoor shower in the master bathroom. It will have you coming home wondering how you can blow out a wall in your bathroom and make one for yourself. 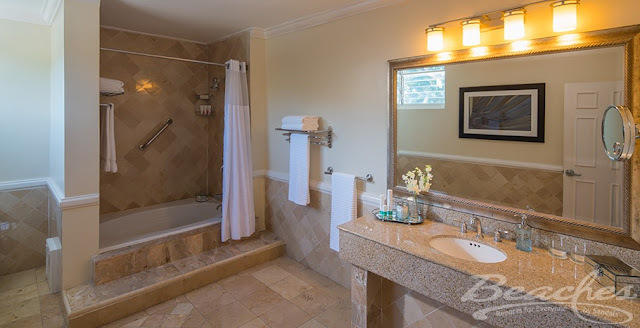 Don't worry, if you're not feeling adventurous enough to shower outside there is also an indoor shower as well as a Relaxing Hot Tub for two. 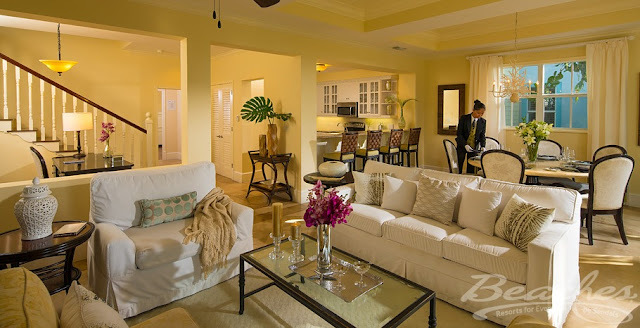 Suites come with a living room, dining room area, and a fully equipped kitchen, too. All the amenities and comforts of home, but even better. 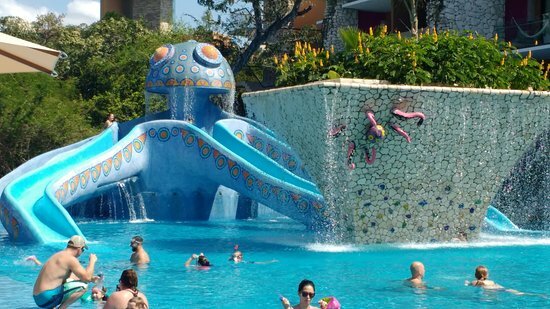 Why do we recommend this resort for families with younger children? They have a great kids club for little kids, including a fun ball-pit. Plus their kid-sized loungers and umbrellas by the kids pool are adorable. I mean how can you not love these mini-loungers? 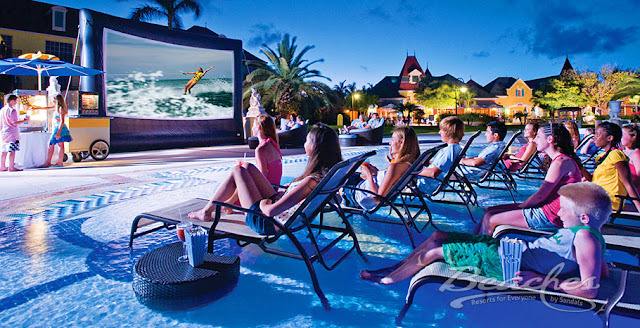 Sadly, aside from a "family lounge" for kids ages 13 and older, where there is a place to hang out, watch movies, listen to music, and eat, teens won't find much to do here like at other resort chains. 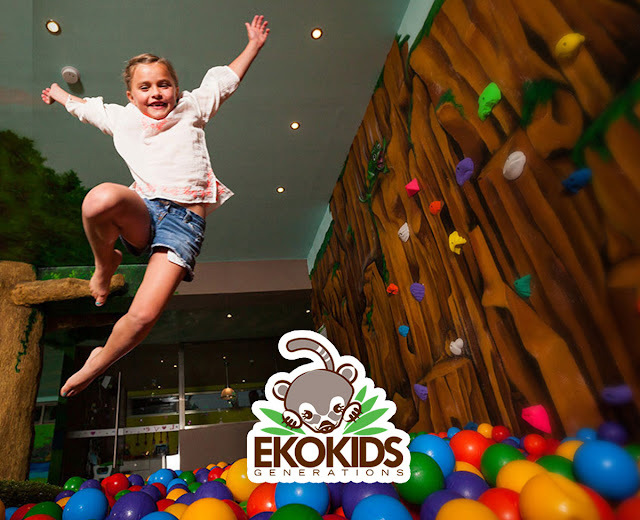 Those middle aged tweens may find this resort a bit of a let down simply because the Eco Kids club is open to kids as old as 12, but most of the things in the club are geared for a much younger age, and older kids don't always like being lumped in with the smaller aged children. So this is a great place to take them when they're still little, but you may want to find a different spot for older children. Go ahead, live like a rock star for a week. It's okay. You and your family have earned it. Stop cramming into a regular room or even a connecting suite. 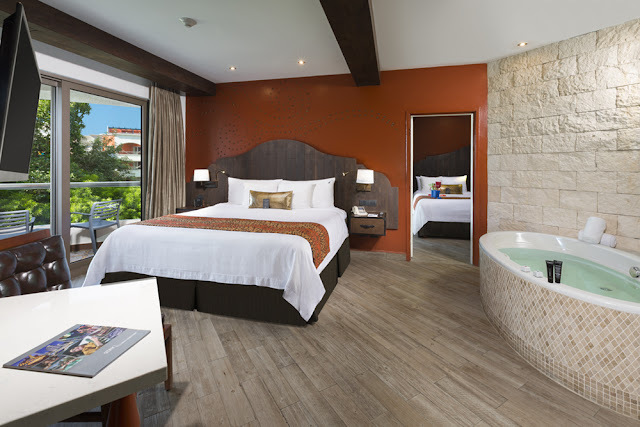 Instead, consider one of the two bedroom options at Hard Rock Riviera Maya, like this Sky Terrace suite that comes with a second story patio and jacuzzi tub. Upgrade to this suite and almost triple your living space and receive the top level amenities and perks. 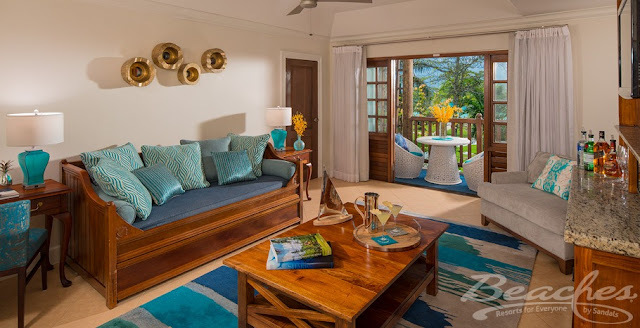 You'll have similar rooms to the Sky Terrace suite but with more space, including your own massive living room and dining room area, plus some pretty spectacular beachfront views. 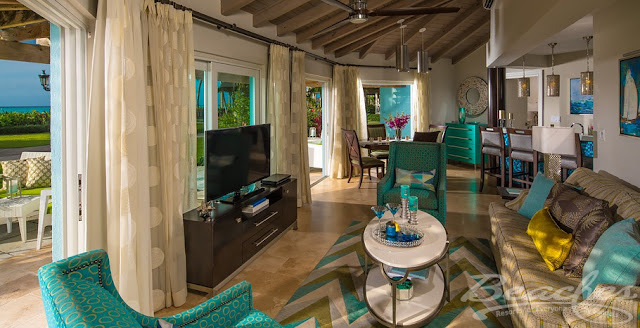 We toured this suite and it seriously ROCKS! 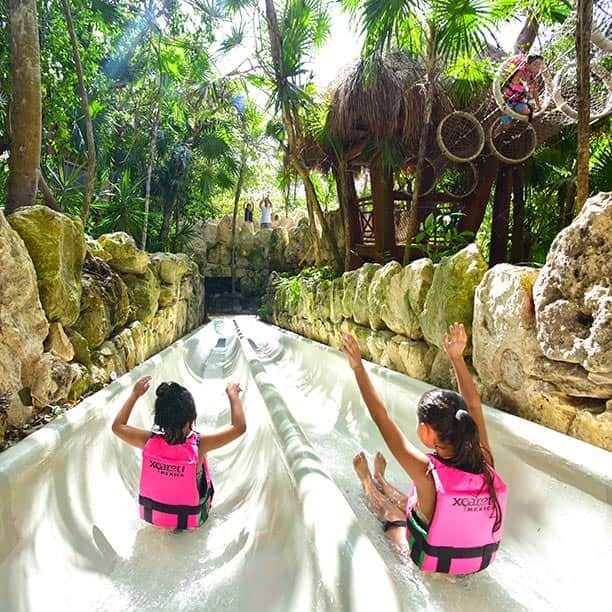 While Hard Rock Riviera Maya is great for families of kids all ages, we recommend this resort most for families with children 8 years of age and up because has several fun amenities with age limits, like Camp Woodward where kids must be 7 and older to get in. Giving you a one-of-a-kind chance to snowboard and snow ski in Mexico, along with a skate and BMX park, parkour, cheer, and more. Or the Rockaway Water Park where kids under 8 must be supervised by an adult. 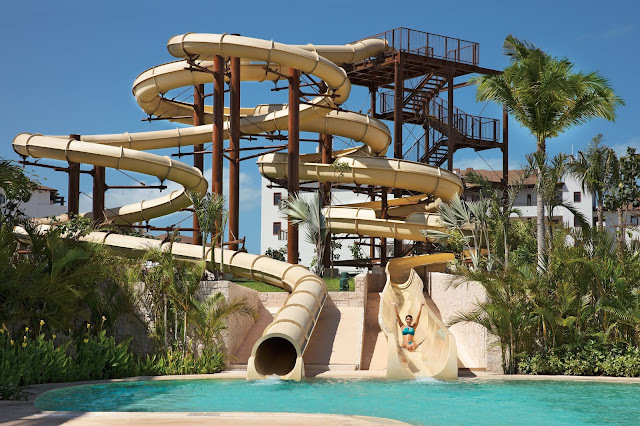 There are teen and adults-sized slides which offer twists and turns or straight drops. As well as slides for younger smaller-sized kids. Plus the kids club clearly rocks! 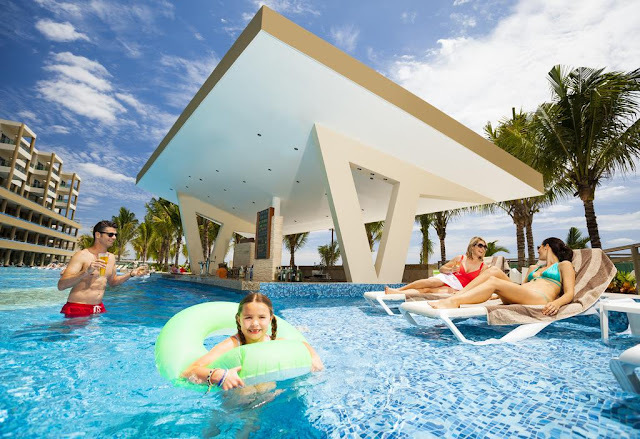 Families who love music will love Hard Rock Riviera Maya. Not only will you be surrounded by the memorabilia you've come to know Hard Rock to have on property, but music is the core of this resort. You won't be able to go much of anywhere on property without hearing some of your favorite tunes playing. Aside from occasional live concerts from celebrity artists, you can make your own music, including having a guitar brought up to your room (no extra charge). 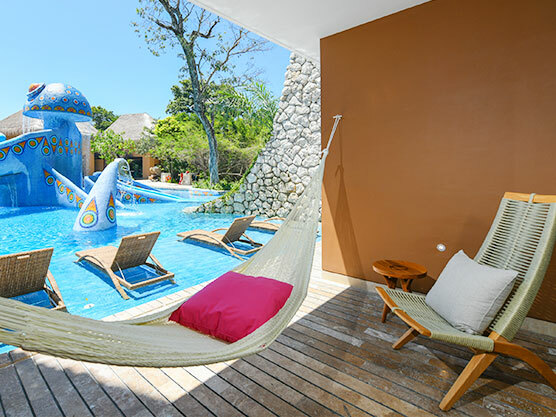 However, families with smaller children can also enjoy this property, especially because it offers "Ultimate Playtime" packages based on age ranges that include extras such as high chair, in-room crib, baby bath tub and more. These items come at an additional cost to "rent" for your stay. You can't go wrong with either of these options, but at the end of the day it comes down to personal preference. 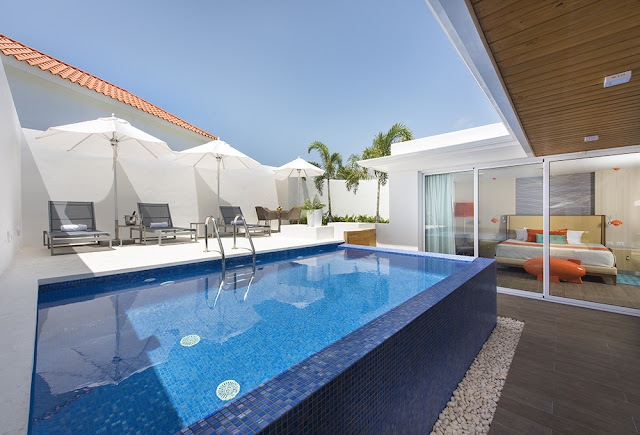 You could go with the option that has the smaller private plunge pool. It's a great option for families who want a bit more privacy when it comes to having pool access. 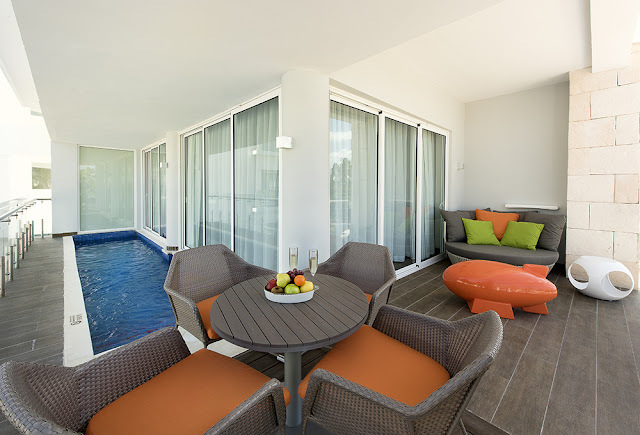 Or you can go with the Swank Wraparound Swim-Up Suite which gives you a bigger pool but one that you share with the other room categories. 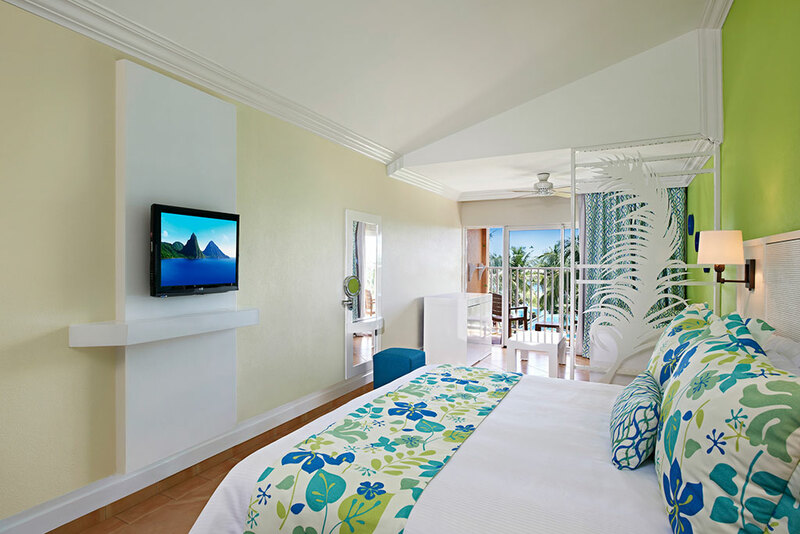 However, your room will be on the end with a wrap around area, giving you a little more privacy from the other rooms. Either way both options have a beautiful room layout which gives parents privacy from the kids with a separate master bedroom and a living room area with a double pull out sofa bed for the kids. 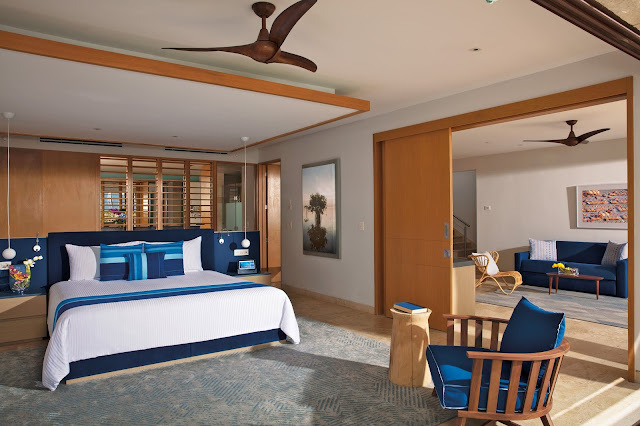 Yeah, we could definitely envision ourselves lazing around this suite for a week. What about you? Talk about the coolest themed suite ever. You don't even need to be a Sponge Bob fan to appreciate how awesome it is. 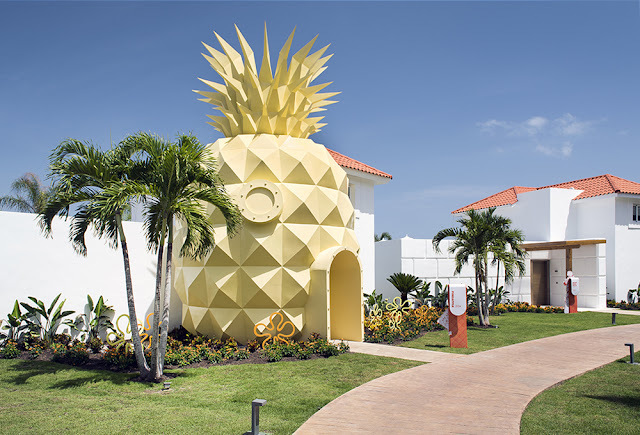 First of all, it's shaped like a giant pineapple! Plus, it's got some pretty unique decor. 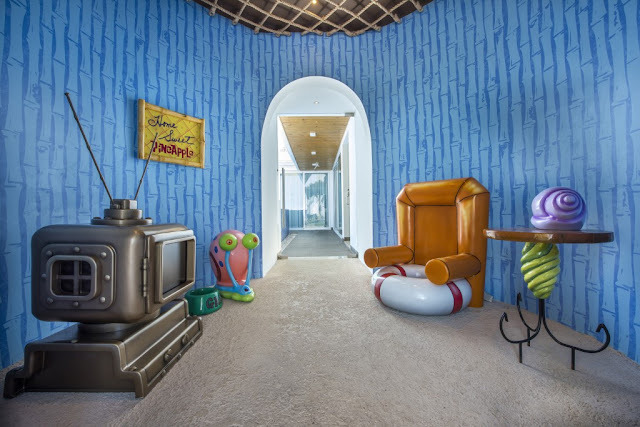 Not only is the entry way decorated like Sponge Bob's living room, but the rest of the suite has "under the sea" decor to tie in with the official suite theme. It's like stepping into your TV. 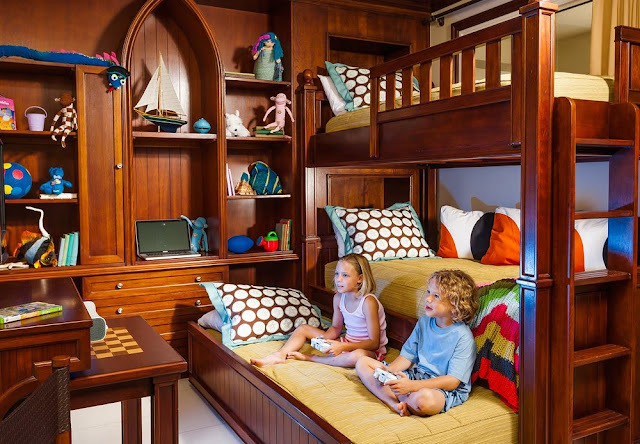 It has ample bedroom space for the kids, and no need for them to share a bed. 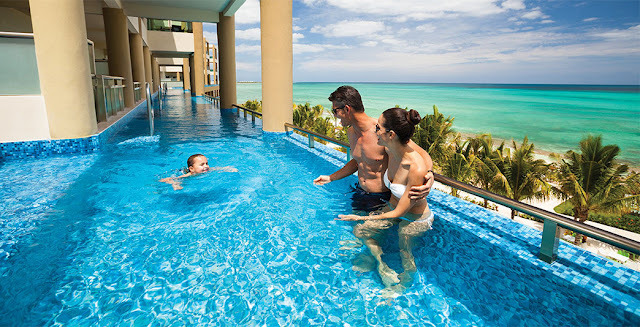 Plus, the absolute best part of this entire suite is that your family gets their very own private pool. 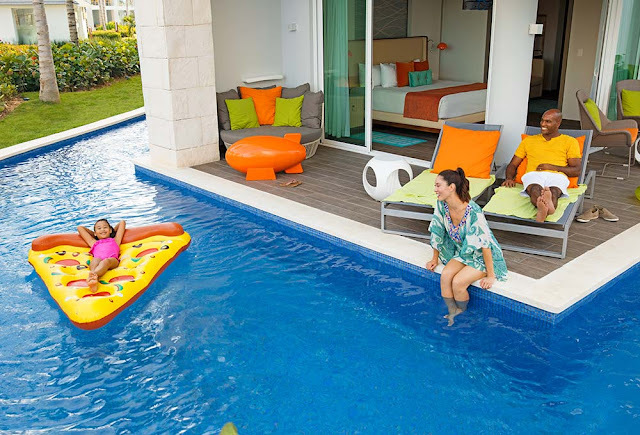 No need to even leave your villa to enjoy the sunshine and splash around in the cool water. With the area walled off for privacy, it's really the perfect family option. Of course, you can always go for the regular Pool Super Villa which is the exact same set up, just without the pineapple shaped entry way and Sponge Bob decor. 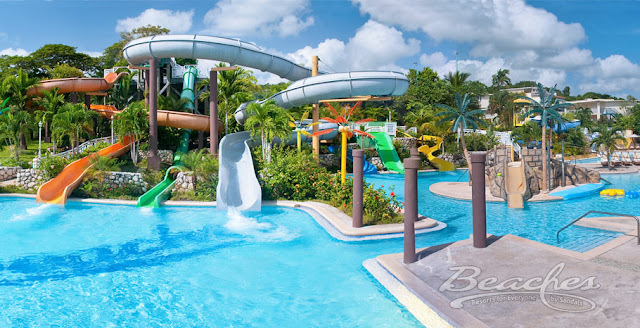 Why do we recommend this resort for families with kids of all ages? Because it caters to families with kids of all ages. The water park alone is a cool feature! 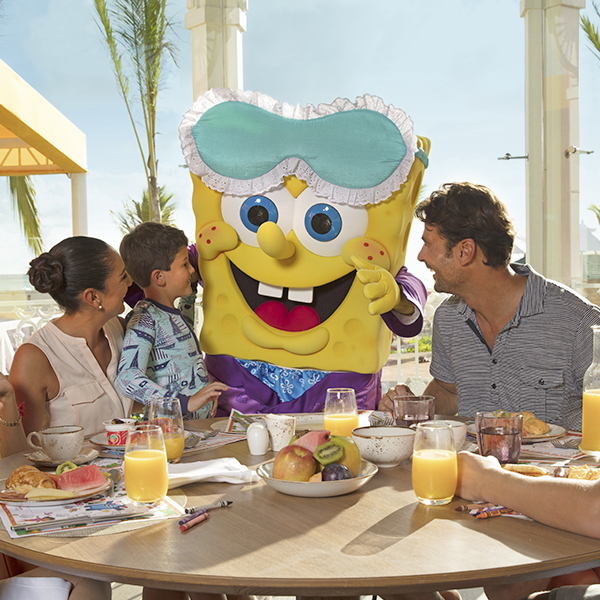 But there is also character dining with your favorite Nick characters like Sponge Bob, Dora, or Paw Patrol. 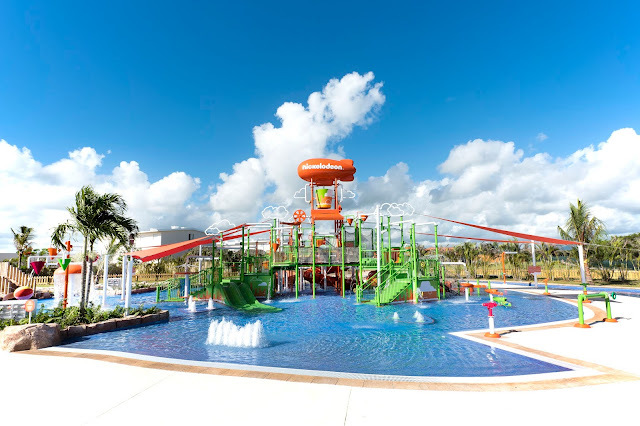 You'll find the "kids hub" called Nickelodeon Place where there is the water park named "Aqua Nick" and the Plaza Orange which is all things Nickelodeon-themed. Remember the show "You Can't Do That On Television"? If you do then you'll remember the famous green slime always dumped on people's heads. 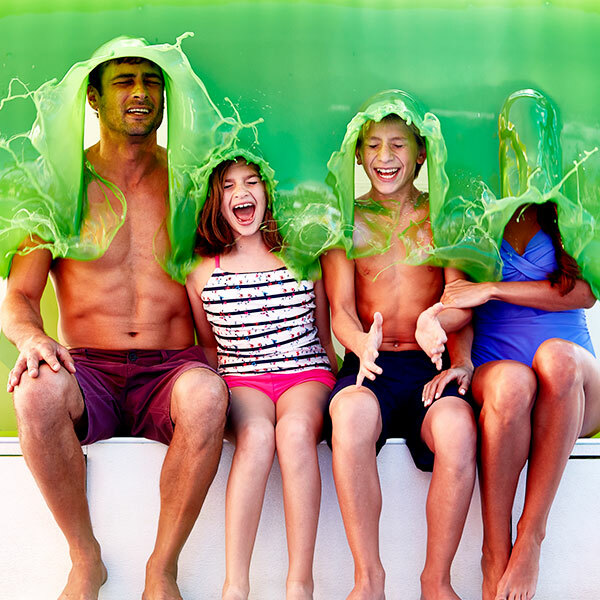 Well, beware, Nickelodeon Punta Cana has it! 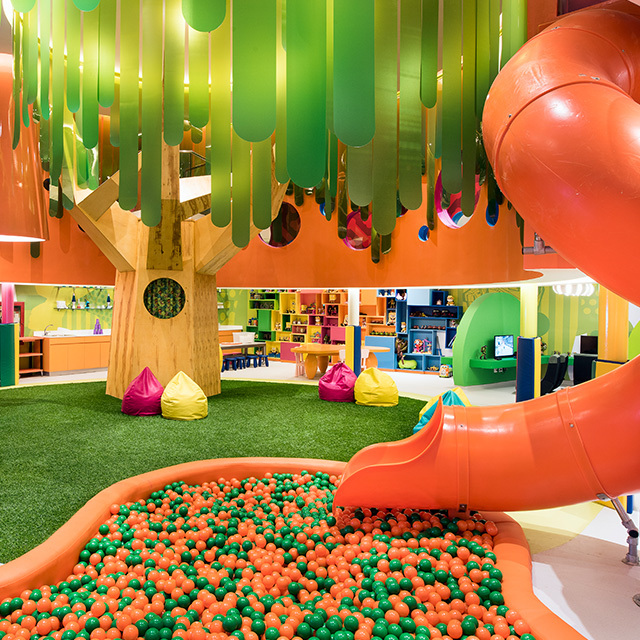 For the younger kids ages 12 and under, there is a kids club complete with a ball-pit and slide. 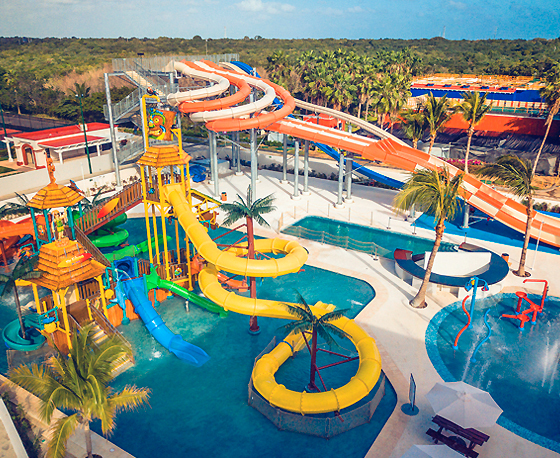 There are so many options for family-friendly fun in the Caribbean and Mexico. We're always looking for whats new and may add or update our list as new resorts come out with exciting features and beautiful family suites. Remember, our team of experts is standing by always to help you plan and book your next family vacation. Our services are free of charge and we can get you the same prices you see online, if not better even at times.